Rules for this Code Section have been developed considering the needs for applications that include piping typically found in electric power generating stations, in industrial and institutional plants, geothermal heating systems, and central and district heating and cooling systems. This Code prescribes requirements for the design, materials, fabrication, erection, test, inspection, operation, and maintenance of piping systems. Where service requirements necessitate measures beyond those required by this Code, such measures shall be specified by the engineering design. Piping as used in this Code includes pipe, flanges, bolting, gaskets, valves, pressure-relieving valves/ devices, fittings, and the pressure-containing portions of other piping components, whether manufactured in accordance with standards listed in Table 126.1-1 or specially designed. It also includes hangers and supports and other equipment items necessary to prevent overstressing the pressure-containing components. 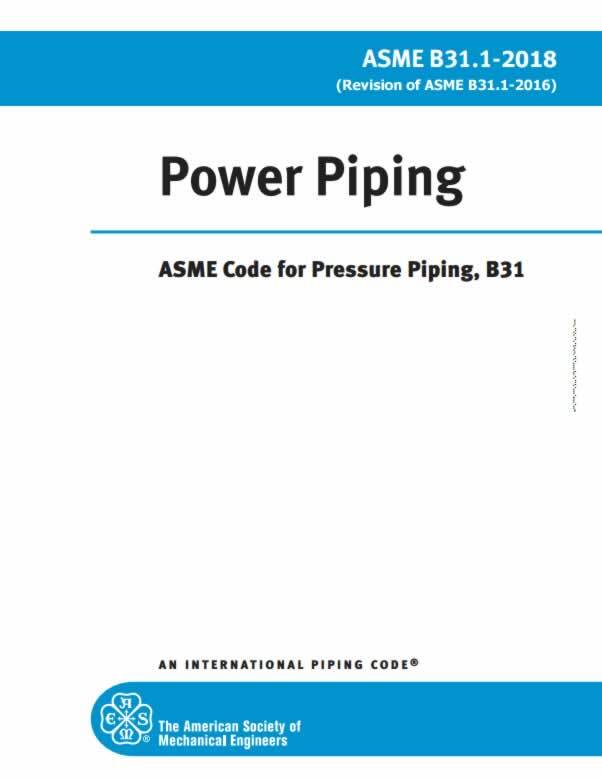 Rules governing piping for miscellaneous appurtenances, such as water columns, remote water level indicators, pressure gages, and gage glasses, are included within the scope of this Code, but the requirements for boiler appurtenances shall be in accordance with ASME Boiler and Pressure Vessel Code (BPVC), Section I, PG-60. The users of this Code are advised that in some areas legislation may establish governmental jurisdiction over the subject matter covered by this Code. However, any such legal requirement shall not relieve the owner of his/her inspection responsibilities specified in para. 136.1. Power piping systems as covered by this Code ð18Þ apply to all piping and their component parts except as excluded in para. 100.1.3. They include but are not limited to steam, water, oil, gas, and air services. (a) This Code covers boiler external piping as defined below for power boilers and high-temperature, high-pressure water boilers in which steam or vapor is generated at a pressure of more than 15 psig [100 kPa (gage)]; and high temperature water is generated at pressures exceeding 160 psig [1 103 kPa (gage)] and/or temperatures exceeding 250°F (120°C). (3) the first threaded joint in that type of connection, and that extends up to and including the valve or valves required by para. 122.1. The terminal points themselves are considered part of the boiler external piping. The terminal points and piping external to power boilers are illustrated by Figures 100.1.2-1, 100.1.2-2, 100.1.2-3, 100.1.2-4, 100.1.2-5, 100.1.2-6, and 100.1.2-7. Piping between the terminal points and the valve or valves required by para. 122.1 shall be provided with Data Reports, inspection, and stamping as required by ASME BPVC, Section I. All welding and brazing of this piping shall be performed by manufacturers or contractors authorized to use the ASME Certification Mark and appropriate Designators shown in ASME CA-1, Conformity Assessment Requirements. The installation of boiler external piping by mechanical means may be performed by an organization not holding an ASME Certification M a r k . H o w e v e r , t h e h o l d e r o f a v a l i d A S M E Certification Mark, Certificate of Authorization, with an “S,” “A,” or “PP” Designator shall be responsible for the documentation and hydrostatic test, regardless of the method of assembly. The quality control system requirements of ASME BPVC, Section I; ASME CA-1; and ASME QAI-1, Qualifications for Authorized Inspectors shall apply. The valve or valves required by para. 122.1 are part of the boiler external piping, but do not require ASME BPVC, Section I inspection and stamping except for safety, safety relief, and relief valves; see para. 107.8.2. Refer to ASME BPVC, Section I, PG-11. Pipe connections meeting all other requirements of this Code but not exceeding NPS 1∕2 (DN 15) may be welded to pipe or boiler headers without inspection and stamping required by ASME BPVC, Section I. (a) economizers, heaters, pressure vessels, and components covered by Sections of the ASME BPVC. (b) building heating and distribution steam and condensate piping designed for 15 psig [100 kPa (gage)] or less, or hot water heating systems designed for 30 psig [200 kPa (gage)] or less. (c) piping for hydraulic or pneumatic tools and their components downstream of the first block or stop valve off the system distribution header. (d) piping for marine or other installations under Federal control. (e) towers, building frames, tanks, mechanical equipment, instruments, and foundations. (f) piping included as part of a shop-assembled packaged equipment assembly within a B31.1 Code piping installation when such equipment piping is constructed to another B31 Code Section (e.g., B31.3 or B31.9) with the owner's approval. See para. 100.2 for a definition of packaged equipment. This Code does not provide procedures for flushing, cleaning, start-up, operating, or maintenance. Code users are advised, however, that the cleaning and purging of flammable gas systems may be subject to the requirements of NFPA Standard 56.